"Hi Tilly and Tilly’s readers! Thank you so much for having me here to write about a day in my life. I’ll admit I was a little daunted by this prospect because it seems that every day is so different! I’ll do my best to try to wrangle my various tasks into something coherent for you to read. 1. Blogging. First and foremost, I’m a blogger. The blog doesn’t directly bring in the most money, but I can definitely say that every opportunity I’ve been given has come about because of my blog. 2. Teaching sewing at The Sewing Studio here in New York. I teach group classes once or twice a week, but the majority of my teaching income comes from private lessons. I have a group of regular students and I meet with each of them once a week for two hours, so it’s steady work. 3. Writing. I have a book coming out next year, woo hoo! I also write articles for sewing magazines. 4. Editing and proofreading craft books for STC Craft/Melanie Falick Books on a freelance basis. 5. 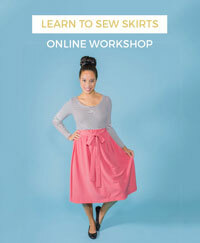 Teaching sewing online. Earlier this year, I launched my first online course with Craftsy, Sew Retro: the Perfect Fit Bombshell Dress and it’s been a great success! I loved the experience of making that course; it was very gratifying to be able to teach really intricate garment construction. 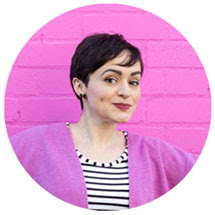 I’ll be filming my next online course in January! 6. Traveling to conferences and events to teach. 7. Selling ad space on my blog. I have an advertising program on my blog, and it brings in a small chunk of my income. 8. Another super exciting thing that I can’t tell you about yet but it’s killing me because I’m the worst at keeping secrets. I live in Astoria, a neighborhood in Queens, New York. I start each weekday by getting up around 9:00, right after my husband leaves for work. I wish I could be more of an early riser. But, well, I’m not. Moving on! I usually spend the mornings working at home. I don’t get dressed or do my hair/makeup until I’m preparing to leave the house. Many people would find this slovenly, I suppose. I had grand ideas of getting dressed every morning and looking fabulous to work at home. But then I figured: what’s the point of working freelance if you can’t do it in your jammies? Mornings are my “administrative/writing” time. I have coffee in bed with my laptop and check my e-mail. I answer e-mails for a bit, respond to questions on my online course, and work on my book. My two cats are usually nearby. In fact, Henry stays by my side if I’m home (he even follows me into the bathroom) so I never feel lonely. If I’m working on a freelance project, I’ll often spend long-ish hours proofreading or editing. For instance, I’m currently proofreading a book on terrariums (which are rad, by the way) and I’ll work in big chunks of time to get it done by a deadline. In the afternoons, I usually head to the Sewing Studio in Manhattan. I take the subway and it’s about a 20-30 minute commute. I love not being a part of the rush-hour commute anymore! Sometimes I read or embroider on the train, but usually I just sit and think. It’s quite peaceful, actually. The Sewing Studio has become my office in a sense. I bring my laptop and any patterns or sewing projects I’m working on, and get things done between lessons and classes. I often have a private lesson in the afternoons. Tuesdays I teach late, until about 9:00 pm. Other days I’m home around 6:00 or so. Fridays I generally work at home all day, and I get stir crazy around 1:00 or 2:00, the time I usually leave for the studio. So I get dressed and run an errand that involves taking a long walk in my neighborhood. Sometimes it’s grocery shopping or going to the post office, but other times it’s something silly like buying a new shade of nail polish. Oh! You asked about eating. I find my daytime meals very tedious and annoying to deal with. I have cereal or a peanut butter and honey sandwich for breakfast, and then I grab something light for lunch from one of the many places near the Sewing Studio. My husband gets home from work around 6:30, and he usually makes dinner. (Mostly because if I did it, we’d have cheese and crackers or peanut butter sandwiches all the time.) It’s usually something simple with a salad, but on the weekends he makes really extravagant things like delicious stews and banana cream pie! I do the dishes. Jeff is a writer too and he spends his evenings working on his latest novel. I’ll use this time to write a blog post or work on a sewing project for fun. At around 10:00, we have tea together and chat or watch a sitcom. Jeff goes to bed and I stay up - reading, writing, or sewing - until about 1:00. All in all, it’s an extremely pleasant existence and I think I’m incredibly lucky to have this life. My favorite parts are the ones when I’m feeling completely inspired, usually when I’m at the beginning of a new idea - a new design or a new subject that I’m compelled to blog about. I also love my interaction with my private students, because we get to know each other so well. They’re all a big part of my life now. I like going to conferences because it feeds my urge to be “on stage” but I’m trying to cut down on traveling in the next year or so, just because I find it a bit stressful. 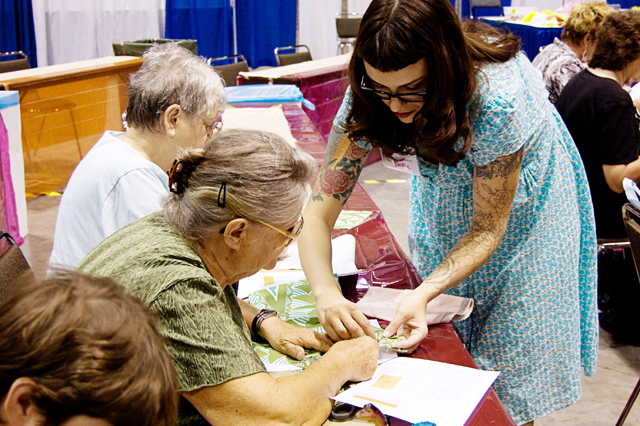 But I’ll definitely go to the big sewing shows because they are so incredibly fun and inspiring. The hardest part is something that I think a lot of writers and creative types deal with: self-doubt. 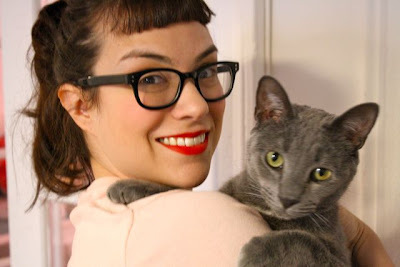 I go through periods when I’m really affected by a negative comment or don’t feel qualified to write a book or show someone how to make a bias-cut wedding gown. And perhaps I’m not! But there’s no subject I feel more passionately about than fine garment sewing and sharing it with others, and that at least counts for something, right? And, to be honest, I’ve learned the most from critical feedback; it always pushes me to try harder. It also helps that 99% of the interaction I have is with completely lovely, supportive, talented people! Thank you again for hosting me here, internet friends! And hey - let me know if I can shed any more light on the freelance sewing life." Phew! I feel exhausted just reading that. No wonder you sleep in late. I bet even your jammies are super stylish though. Thanks, Gertie! 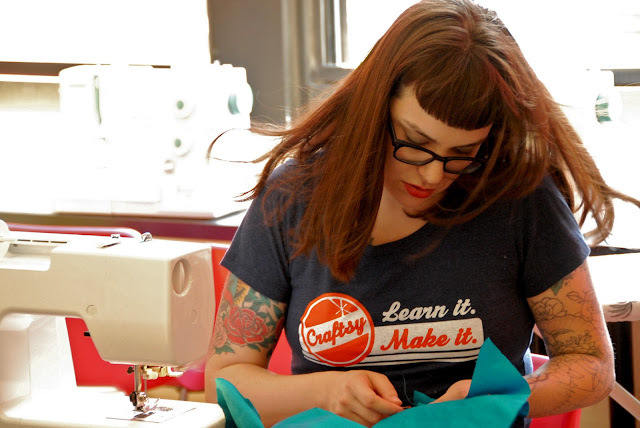 Musings on Pattern Cutting... and a Giveaway!